I’m making excellent progress on the little project I mentioned earlier this week. I should be able to show it by this weekend. It’s coming together fairly quickly even with distractions like baby, Pinterest, Facebook, cooking, cleaning and baseball. In other words life in general. I think that’s why I like small projects. You feel like you accomplish so much even if you only get to work on it for 15 minutes in a day. This project includes some hand embroidery work. My mom taught me to embroider (and cross stitch) when I was in my tweens. I love it but don’t often have the patience to do a whole embroidery project. In the time it would take me to complete a small 8x10 piece I could have a whole quilt finished. I’m all about results, the more bang for your buck the better! 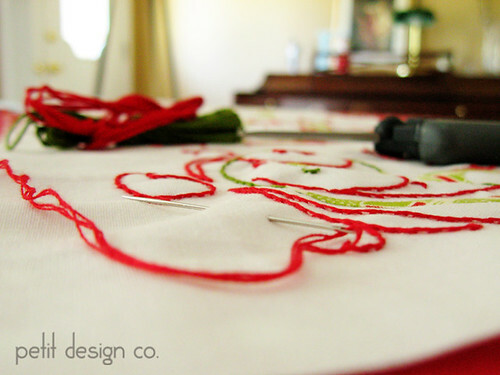 Do you like to embroider by hand? Do you like to combine quilts with a little hand embroidery or does the thought make you put the quilt pattern back on the shelf? One more question. Do you hoop or not when you hand embroider? I think I’m more comfortable without a hoop unless I’m doing a lot of satin stitching. I love to embroider, also cross stitch, hardanger, blackwork... it's so soothing, but, like you, I don't do it too often as i like the quick results too! I am on an embroidery kick lately. My grandmother taught me during the same age. Saw your post on Sew Many Ways.